Reference number for this case: Beg-oct-54-StPierre. Thank you for including this reference number in any correspondence with me regarding this case. Ufologist Aimé Michel notes in his book that at 03:40 in the morning, a baker of the southern suburbs of Calais left his bakehouse to take some fresh air. He then saw a sort of luminous craft of yellow color which quickly descended from the sky and landed close to the railway not far from the road RN 43 close to the locality named Saint-Pierre-Halte. The object resembled a mushroom and the witness said that it measured four meter of diameter and two meters in height. The machine soon flew away and disappeared from view. Oct. 15, 1954, 03:40, Saint-Pierre-Halte (France). A baker saw a brilliant yellow craft descend rapidly and land on the railroad tracks. It was shaped like a mushroom, about 4 m diameter, 2 m high. (La Croix, 16 oct 1954) (62; M 180). Garreau and Lavier note that on October 14, 1954, in Saint-Pierre-Halte in the Pas-de-Calais, a baker's assistant told that towards 03:20 he had seen a yellow shiny machine posed on the railway. He indicated that the object was circular, with approximately four meters in diameter and two meters in height. He had quickly moved away without observing the continuation of the events, because he was frightened. The author ensures that there was an alignment of cases in Western Europe on October 15, 1954, proving that the witnesses neither had dreamed nor invented as one could think by taking each case apart; he says one of the cases is: "Calais (France)". The two authors indicate that in Saint-Pierre Halte close to Calais in the department of the Pas-de-Calais, on October 14, 1954 at 03:40 a.m., whereas he took some fresh air in front of his bakehouse, an anonymous baker's assistant from Calais saw a yellow and shining craft of 2 meters height and 4 meters diameter land on a railway. This object had the shape of a mushroom. Being on the road of Saint-Omer, the frightened witness moved away quickly without observing the departure of the machine. The authors indicate that the sources are case 263 of the Vallée catalogue; La Croix for 10/16/54; C. Garreau and R. Lavier in "Face aux ET" page 127; Aime Michel in "A Propos des Soucoupes Volantes" page 220. The author indicates that on October 15, 1954, there were 8 sightings, 5 were in a line, one of them was in Calais. Godelieve van Overmeire indicates that in 1954, on October 14, in France, in St Pierre Halte (Calais), "at 03:40 a baker saw a yellow and shining craft go down quickly and land on the railway. The shape of the object was that of a mushroom, approximately 4 m in diameter and 2 m in height." The sources are indicated as "La Croix, 16 Oct 1954" and "Jacques Vallée: 'Chronique des apparitions ET' - DENOEL 1972 - J'AI LU COLL. - p. 282". She adds that the occurrence happened on the 14th not the 15th according to: "M. FIGUET/ J.L. RUCHON: 'Ovni, premier dossier complet...' - Alain Lefeuvre pub. 1979, p. 160". 1954 – St.-Pierre-Halte, France. At 3:40 a.m. a baker saw a brilliant yellow craft descend rapidly and land on some railroad tracks. It was mushroom shaped, about four meters diameter, and two meters high. (Sources: Aime Michel, Flying Saucers and the Straight Line Mystery, p. 180; Jacques Vallee, Passport to Magonia: A Century of Landings, p. 230). 3:40 : In Saint-Pierre-Halte (France), 1 baker sees 1 yellow and shining machine go down quickly and land on the railway. The shape of the object is that of a musroom, being approximately 4 m in diameter and 2 m high. The source is indicated as "La Croix, October 16, 1954." This ufologist indicates that on October 14, 1954, in "Saint-pierre Halte", in the Pas-de-Calais, the suburbs of Calais, "As he takes fresh air in front of hiss bakehouse at 3 40, a baker's assistant sees a yellow and brilliant machine land on a railway, near the road of St Omer. This object has the shape of a mushroom of approximately 2 meters in height on 4 meters in diameter. The frightened witness moves away quickly without observing the departure of the machine." The sources are noted as "Vallée Catalogue, case #263. - La Croix for 10/16/1954. - C. Garreau and R. Lavier Face aux E.T. page 127. Aimé Michel A Propos des S. V. page 220." Luc Chastan indicates in his database that in the Pas-de-Calais in "St Pierre Halte (Calais)" on October 14, 1954 at 03:40 hours, "While he takes fresh air in front of his bakehouse, a baker's assistant sees a yellow and shining craft 2 meters in height and 4 meters in diameter, land on a railway, this object has the shape of a mushroom. Being on the road of Saint-Omer, the frightened witness moves away fast without observing the departure of the craft." Donald Johnson indicates that on October 14, 1954, at 3:40 a.m. a brilliant, yellow machine in the shape of a mushroom, two meters in height and four meters in diameter, was seen resting on railroad tracks in Saint-Pierre Halte by a baker's assistant from Calais. The sources are indicated as Figuet, Michel and Jean-Louis Ruchon, OVNI: Le premier dossier complet des rencontres rapprochees en France, p. 160, citing La Croix, October 16, 1954; Aime Michel, A Propos des Soucoupes Volantes, p. 220. *Oct. 14, 1954 - At 3:40 a.m. a brilliant, yellow machine in the shape of a mushroom, two meters in height and four meters in diameter, descended rapidly and was seen resting on some railroad tracks in Saint-Pierre-Halte, France by a baker's assistant from Calais. (Source: Michel Figuet & Jean-Louis Ruchon, OVNI: Le premier dossier complet des rencontres rapprochees en France, p. 160, citing La Croix, October 16, 1954; Aime Michel, A Propos des Soucoupes Volantes, p. 220; Aime Michel, Flying Saucers and the Straight Line Mystery, p. 180; Jacques Vallee, Passport to Magonia: A Century of Landings, p. 230--who lists the date as Oct. 15). The author checks "the myth of alignment SOUPO ", i.e. the assertion from Jacques Vallée and Aimé Michel about an alignment of 8 UFO observations on October 15, 1954, in Europe. The author shows that none the cases was correctly dated except perhaps one, that the alignment is disproved and the observations also. He indicates that according to Aimé Michel, the observations of this date are all by night. "At 3:40 of the morning, a baker of the southern suburbs of Calais, on the English Channel, comes out of his bakehouse to take some fresh air, like all the bakers of the world do." He notes that in reality, he was riding a moped. "He then sees a kind of luminous machine, of yellow color, which goes down quickly and lands on the railway not far from main road 43, close to the place called Saint-Pierre-Halte. The object resembles a mushroom and is, according to the witness, four meters in diameter and two meters high. It flies away soon and disappears." It notes that in reality, the witness did not stop and did not see the object taking off. Dominique Caudron notes that Antonio Ribera, in "Procés aux OVNIS", De Vecchi 1975, page 54, says that on Friday October 15, 1954, a series d’observations was reported, including one in Calais, and which, if one studies each fact separately, one can only regret the fragility of human testimonys which gives enthralling stories but one does not know if they are dreams or inventions; Ribera concludes that they are not, with the reason that they are all on a line. And here it is that in Calais, another bakery worker had reportdely also seen, on the railway, as he went to his workplace, an enigmatic machine which had chosen the railway which goes from Calais to Dunkirk, very close from Saint-Pierre Halte, to land. But let's hear Mr. Thery speak. - I had just left the house. It was approximately 3:40 of the morning. I rode on the road of Sintt-Omer [Saint-Omer], between Virval and the Station of Saint-Pierre Halte. My motorbike was going fast. I was going to start the turn to engage on the Castre path. The night was rather beautiful and the moon diffused a quite important clearness to distinguish rather far in front of oneself. At the time when I was going to cross the level crossing, my attention was automatically drawn and I turned the head towards the left. "What I then saw astonished me: at about fifty meters from me, on the railway straightforwardly, on the side of Coulogne, at th very place where the trains going to or coming back from Dunkirk pass, I saw a semi-spherical form. I said to myself; Hold on, here is a curious construction on the railway. The mass was approximately two meters tall, by three or four [meters] broad. Il was across the railway. I repeat it, his color was of a very brillant yellow." Obviously, on the spot one sees nothing any more, for during the few days quite a number of trains have passed. 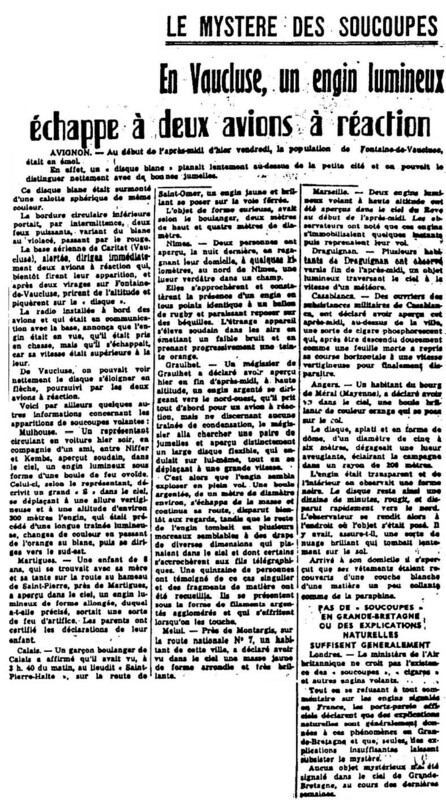 He notes the "odd detail: Mr. Théry does not stop", and alerts that the newspaper clearly says that the sighting took place a few days ago, and thus, even if one would classify this as a landing, it does not belong to the October 15 alignement. Garreau and Lavier as well as Figuet and Ruchon date this sighting of October 14, not October 15. [---] Article in the local newspaper Nord Littoral, France, page 2, October 15, 1954. [am1] "Mystérieux Objets Célestes", book by Aimé Michel, Seghers publisher, France, page 242, 1958. [gl1] "Face Aux Extra-Terrestres", book by Charles Garreau and Raymond Lavier, Delarge publisher, France, page 127, 1975. [ri1] "Procès aux OVNI", book by antonio Ribera, De Vecchi publisher, France, page 54, 1975. [fr1] "OVNI, Premier Dossier Complet des Rencontres Rapprochées en France", book by Michel Figuet and Jean Louis Ruchon, Alain Lefeuvre publisher, France, page 160, 1979. 0.1 Patrick Gross August 16, 2004 First published. 1.1 Patrick Gross April 21, 2009 Addition [dj1], [jb1]. 1.3 Patrick Gross October 15,2014 Addition [ni1]. 1.4 Patrick Gross October 26, 2016 Additions [cm1], [ub1]. 1.5 Patrick Gross November 5, 2016 Addition [dc2]. As [dc2] reveals the case of Calais the next day is this case, merge of the two files in here, now including also [am1], [am2], [jv5], [gl1], [jc1]. New date for the case, "Beg. October" instead of "October 14". Additions [ri1], [ub2]. 1.6 Patrick Gross December 5, 2016 Addition [pl1]. 1.7 Patrick Gross February 28, 2017 Addition [rr1].